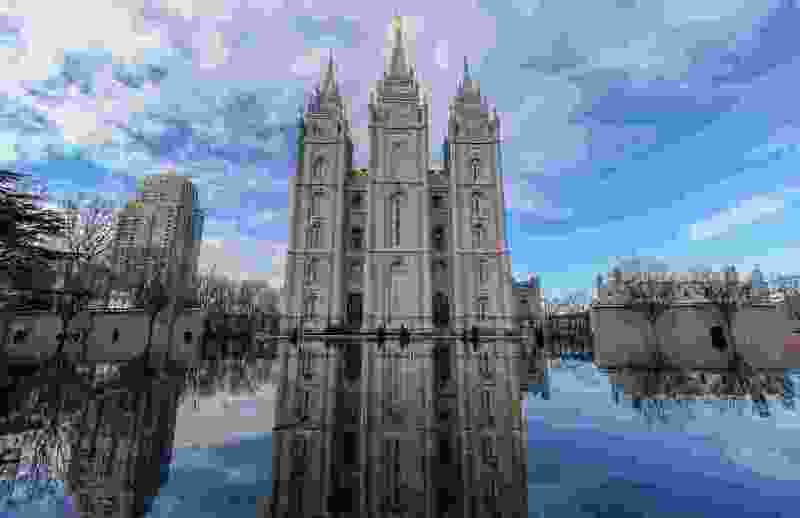 (Francisco Kjolseth | Tribune file photo) Temple Square in Salt Lake City, as seen in January. The Church of Jesus Christ of Latter-day Saints issued an official statement Tuesday opposing a Utah ballot initiative to legalize medical uses of marijuana. The LDS Church on Tuesday appeared to come out against a ballot initiative that would legalize medical marijuana in Utah, a move that followed opposition by Gov. Gary Herbert and the powerful Utah Medical Association in recent days. In a two-paragraph statement, the Salt Lake City-based faith commended the Utah Medical Association (UMA) for issuing its own recent statement opposing the initiative. But the church did not explicitly criticize any part of the legalization effort. “The public interest is best served when all new drugs designed to relieve suffering and illness and the procedures by which they are made available to the public undergo the scrutiny of medical scientists and official approval bodies,” said the statement, which was issued by the church’s governing First Presidency. LDS Church President Russell M. Nelson, the leader of that group, is an internationally acclaimed heart surgeon. Church spokesman Eric Hawkins said he could not provide clarifying information beyond the statement. “The church is supporting the UMA — it’s not the church that’s coming out and attacking,” said Christine Stenquist, president of Together for Responsible Use and Cannabis Education (TRUCE), a group working to educate Utah voters on medical marijuana. She said her group was trying not to be overly reactionary to the statement, seeking to calm its LDS members who were unsure what to make of it. Debate over the initiative has heated up in recent weeks, with Herbert opposing it late last month and the UMA doing the same shortly thereafter. The powerful opposition comes just as initiative organizers are in a final push to gather enough signatures to qualify for the November ballot, ahead of a deadline at the end of this week. In recent polls, voters have shown broad support for the measure. The Utah Patients Coalition, which is organizing the marijuana initiative, said the church statement was misguided. “The LDS Church should be commended for its concern with public health and safety — laudable goals we are pursuing with our proposal,” the group’s director, DJ Schanz, said in a statement. He was gathering signatures Tuesday and told The Salt Lake Tribune that he was “confident things will go our way” in terms of putting the legalization question on the ballot. The church statement comes after recent efforts by the UMA to undermine the initiative. The group representing Utah doctors had accused leaders of the petition of misleading voters into backing marijuana legalization, and it said Utahns who had already signed should seek to have their names removed. The group said the initiative would ultimately lead to legal recreational cannabis use in Utah. But Dan Cottam, a Salt Lake City surgeon and adviser to the ballot initiative, said Tuesday that the UMA’s statement did not represent how he and many other Utah physicians feel about the medical benefits of marijuana. Andrew Talbott, a Park City physician and adviser to TRUCE, had a similar take Tuesday. He said he was disappointed to the see the church’s statement, and he blasted the UMA’s opposition to medical marijuana as only representing a “small slice” of Utah doctors. Herbert seemed to align with the UMA last month, characterizing the initiative — which would allow consumption of several types of medical marijuana products for qualifying illnesses — as overly broad, and potentially opening the door to recreational use. State lawmakers, the Republican governor said, were correct in approving more limited marijuana access for the terminally ill.
Utah voters, however, have consistently supported the idea of legalizing medical marijuana. About 3 in 4 respondents polled recently by The Tribune and the University of Utah’s Hinckley Institute of Politics said they backed the idea. Marijuana remains illegal under federal law, but 29 states allow it for medical use and eight allow it for recreational use. Murray resident Nathan Frodsham, a Mormon member of TRUCE, realized the benefits of medical marijuana years ago, when he was living in Seattle. He found that it helped cope with a spinal condition that causes him chronic pain. But then, he said he read it more carefully. He said the statement does not explicitly oppose the ballot initiative, but rather reiterates a position that Mormon leadership supports traditional methods of approving new drugs through extensive research.